For Christmas this year, my sister-in-law bought me a pizza stone. But not just any pizza stone – one that you can use in the oven as well as on the grill. There is something so utterly Italian about pizza over a fire, so I knew my love of pizza needed to spill into the grilling world. What started as a gift that I intended as a summer staple, has now turned into a year-round necessity. The purpose of a pizza stone is to evenly distribute the heat, as well as to extract moisture to give a crispier crust. And, after experiencing various methods, I have to give the win to the pizza stone. And a pizza stone is a great way to cook this flavorful vegetarian pizza recipe – inside or outside. The pesto adds a great flavor and the cheese and tomatoes are, well, essential to a good pizza. You can use refrigerated pesto (which is what I used to make it an easier weeknight meal) and by doing so you can put this pizza together in 20 minutes. I tend to actually roast the tomatoes, though, to bring out the flavors – but it is your call on whether you want them cold and fresh or warm and sweeter. Thanks to Gina for opening my eyes to the best way to make a pizza. And thanks to Cooking Light for this great, go-to quick pizza recipe! Place a pizza stone in oven; heat for 10 minutes. While pizza stone heats, place crust on another baking sheet sprinkled with cornmeal. Lightly coat crust with cooking spray. 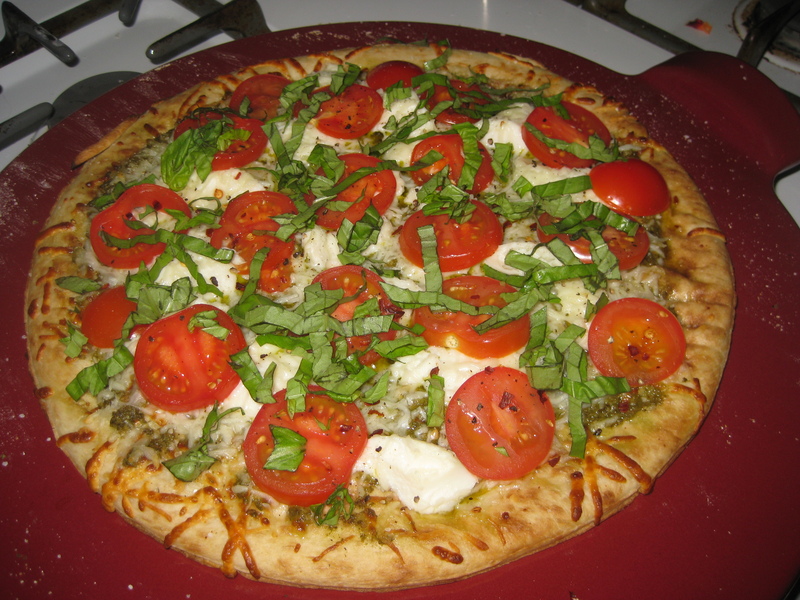 Spread pesto evenly over crust, leaving a 1-inch border; sprinkle mozzarella evenly over pesto. Dollop ricotta, by teaspoonfuls, evenly over mozzarella. Slide crust onto preheated pizza stone, using a spatula as a guide. Broil 5 inches from heat for 5 minutes or until cheese begins to melt. 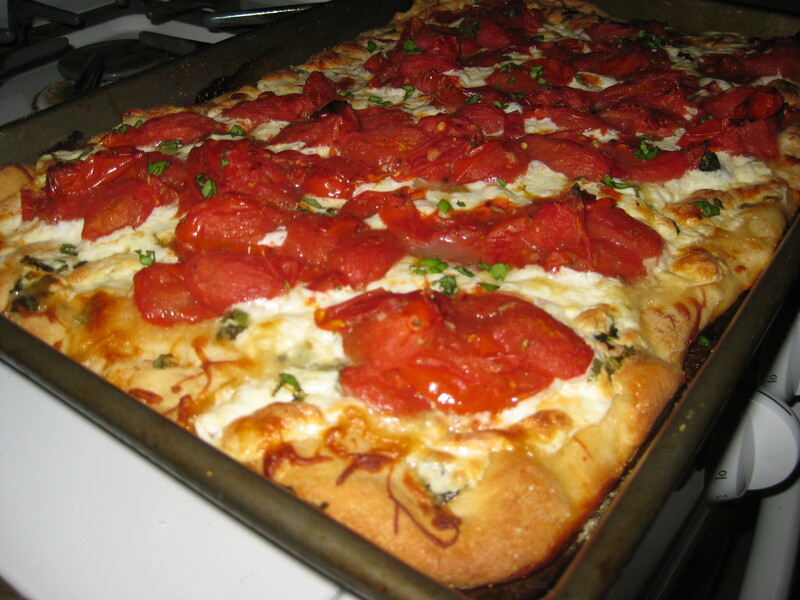 Remove from oven; top evenly with tomatoes, black pepper, and basil. Sprinkle with red pepper, if desired. Cut into 8 slices. To me, sausage screams pork. Sure, it isn’t the most nutritious thing for you to put in your mouth, but doesn’t the taste make all of that guilt go away? After a few weeks of being in Italy and experiencing their sausage, I will admit this gluttonous ingredient has made its way into many of my dishes – pasta, pizza, and just about anything I think it could complement. So, when Cooking Light told me there was a healthier alternative, I pretty must ignored that sentence in the article like it didn’t exist. It isn’t sausage if it isn’t pork, right? Okay, okay, I am not THAT close-minded, but I had skepticism when I read this pizza recipe with chicken sausage. But, it has apple chicken sausage (sounds interesting! ), has sweet onions (yum!) and fennel (so fall!). So, my obsession with seasonal cooking took over my fear of non-pork sausage, and I tried this recipe the other night when the crisp air told me it was officially autumn. Wow. Now, I will admit, it is not the pork sausage you know, so I would never do a comparison. But, for being something different, it tastes great and is a fantastic change of pace. The flavors meld together to really give that fall sense of warm and spice (especially with the fennel). By buying a pre-cooked crust and pre-cooked chicken sausage, there really isn’t too much to this one. It was on the table in about 30 minutes. One tip, make sure to really cook those onions so it brings out their sweet flavor (and eliminates most of its bitterness). Thanks to Cooking Light for broadening my horizons a bit. Pork sausage will not be leaving my cooking repitoire anytime soon, but it is good to know that its cousin, pork sausage, is a relative I need to get to know a bit better! And hey, with a healthier sausage, that means you can have one more slice, right? Heat a large nonstick skillet over medium-high heat. Add sausage to pan; sauté 4 minutes or until browned, stirring occasionally. Remove from pan. Add oil to pan. Add onion, fennel, and salt; cover and cook 10 minutes or until tender and lightly browned, stirring occasionally. Place pizza crust on a baking sheet. 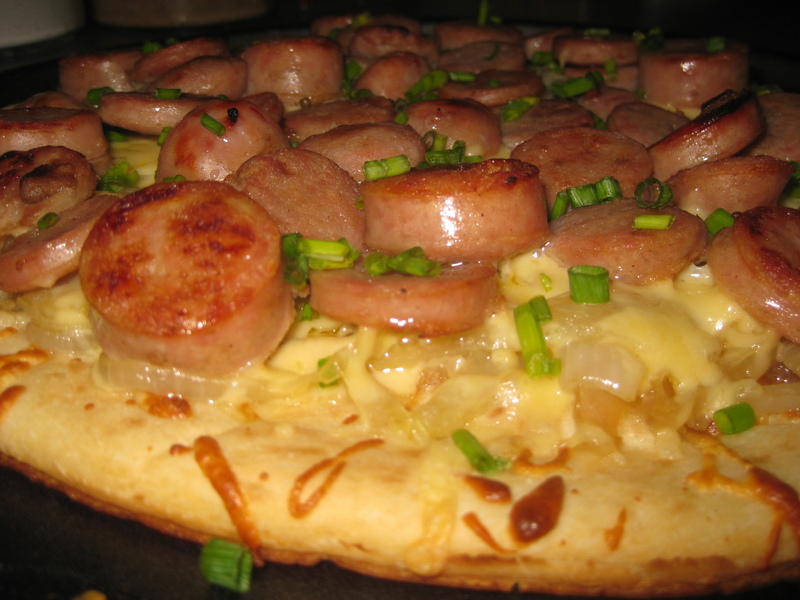 Top evenly with onion mixture; sprinkle with cheese, and top evenly with sausage. Bake at 450° for 12 minutes or until cheese melts. Sprinkle evenly with chives. Cut pizza into 8 wedges. If it weren’t for my husband’s heritage, my love of Italian food and my upcoming trip to Italy, I might not know as much about pizza as I do. But, in watching travel shows, reading articles and skimming magazines, I have a new appreciation for pizza – especially of Italian origin. Growing up I wasn’t a big “plain pizza” fan. I loved pepperoni and even until lately would normally get the pizza with all the fixings. It is once I learned about pizza margherita – and tried it the right way, with the right ingredients – that I fell in love with it. Back in 1844, the King of Italy, and his wife, Queen Margherita di Savoia, were on holiday in Naples. They called the most popular pizza chef (pizzaioli) to make various kinds of pizza for them. But Queen Margherita fell in love with the pizza sporting the colors of the Italian flag, with mozzarella, tomatoes and basil. He affectionately called it Pizza Margherita after the Queen. Although our trip to Italy won’t include Naples, I have always heard you haven’t had pizza margherita until you have had it in Naples. But, this recipe from Bon Appetit has to come in a close second. Cooking the tomatoes on the stove then mixing with basil, garlic, fennel and red pepper flakes give it amazing flavor. I changed the recipe a bit since our grocery store didn’t have the multitude of mozzarella cheeses the recipe requires. My adaptation is below. Position rack in top third of oven and preheat to 425°F. Unroll dough on heavy large baking sheet; pull to about 12×8-inch rectangle, pinching any tears to seal. Fold over edge of dough to make border. 1. Bake a little longer than 20 minutes. 3. Bake the crust ALONE (sans toppings) for about 5-10 minutes to give it a head start, then finish the baking with the toppings. I think it is so easy to get into a food rut. What new variation on chicken should I make tonight? Maybe pork? It sometimes starts to all run together, which is why I love to throw burgers, sandwiches and pizzas in the mix to give a little variety. I think pizzas might be one of the most underrated home-cooked foods. You generally think of delivery or frozen, but it is so quick and easy to make amazing pizza at home. This recipe is a classic Santa Fe pizza and has a great Mexican flare. It is overflowing with ingredients and spicy flavor. If you don’t have chicken strips on hand from leftovers, just saute up some cut up breasts with a little cumin (which is what I do when I make this recipe). Thanks to Bon Appetit for this quick weeknight meal. Position rack in center of oven and preheat to 425°F. Place crust on rimless baking sheet. Leaving 3/4-inch plain border, sprinkle 1 cup cheese, chicken strips and cumin over crust. Top with onion, 4 tablespoons corn, 4 tablespoons cilantro, 3/4 cup cheese, jalapeños and 2 tablespoons corn. Bake pizza until crust is crisp and topping is heated through, about 13 minutes. Top with salsa and remaining 2 tablespoons cilantro. White pizza always sounds a bit strange – isn’t pizza supposed to have tomato sauce? But there is something about white pizza that I just love – a great variety vs. the traditional pizza we all expect. Pizza is an easy weeknight meal that doesn’t entail much prep work, unless you want to make your own dough. I use refrigerated dough in this one, but you could easily make your own if you choose. I am sure if you have a love for other white cheeses, they would deserve some real estate on this pizza as well. This recipe is thanks for Bon Appetit. Preheat oven to 450 degrees. Brush 13x9x2-inch metal baking pan with 1 tablespoon oil. Mix remaining 2 tablespoons oil and garlic in small bowl. Roll out pizza dough on lightly floured work surface to 14×10-inch rectangle. Transfer dough to prepared pan, pushing dough slightly up sides. Brush dough with garlic oil. Top with mozzarella cheese and goat cheese, leaving 1/2-inch plain border. Crumble ricotta cheese over, then sprinkle with Parmesan cheese and basil. Bake pizza until crust is golden brown and cheeses melt, about 18 minutes. Let stand 3 minutes.